Silverfish, as it is evident from their name, have a shiny silvery appearance. Their bodies are leaf-like and have a rounded head and a pointed abdomen. Common silverfish are abundantly found in damp places, especially in underground basements and attics. Silverfish are wingless and compensate for their lack of wings by darting speedily on the ground. Silverfish don’t spread any severe diseases and aren’t a major concern, but a growing silverfish population may indicate other severe problems. Silverfish, as it is evident from their name, have a shiny silvery appearance. Their bodies are leaf-like and have a rounded head and a pointed abdomen. At the rear end of their abdomen, they have three tail-like appendages that are similar in appearance to their two front antennae. The length of the appendages is almost the size of the silverfish’s fragile, wingless body. These pesky insects can grow up to .75 inches in length. Pre-mature silverfish are identical to the adults, only much smaller in size. They have delicate scales on their body. The scales spread throughout the insect’s abdomen and can attach to almost any surface. Common silverfish are abundantly found in damp places, especially in underground basements and attics. They thrive in temperatures ranging from 70 to 80 degrees Fahrenheit. They are difficult to spot because they have no distinct markings on their bodies. However, their silvery scales give them a unique silver-grayish glow. They feed on high-protein content and steer clear from carbohydrates. Gray silverfish leave no place of your house untouched. They are especially fond of dark, hidden places like attics, closets, and storerooms. Unlike the common silverfish, they aren’t shiny in appearance; instead, they have a faded-grey appearance and are about .75inches in length. They also thrive in hotter environments, with temperatures in the range of 80 to 85 degrees Fahrenheit. They get moisture from the plant and animal material they consume. Four distinct vertical darkish-gray markings of scales and tannish-gray color give these silverfish their characteristic appearance. Like other types of silverfish, they prefer to nest in humid environments, with temperatures around the 80 degrees Fahrenheit mark. They can take refuge in any part of your home, especially the parts the gray silverfish prefer. Silverfish are wingless and compensate for their lack of wings by darting speedily on the ground. Their extreme speed also helps them to evade predators. As they shed their skins during the entire course of their lives, you can often spot their fragmented silver scales lying in their preferred habitats, such as humid areas and places replete with food sources. They don’t require a lot of water, but can’t live without carbs, proteins, and sugars, and they are also frequently found feeding on newspapers, books, and fabrics. The lifespan of a silverfish depends on several environmental factors, such as available food, humidity, and temperature. The nymphs undergo several molts before maturing into adults. This molting process may sometimes stretch to three years. The average lifespan of a silverfish is anywhere from 3 to 4 years. Female silverfish lay 1 to 200 small, oval-shaped eggs in tiny cracks and crevices that have a lot of moisture. When the environmental conditions are favorable, the eggs hatch in a matter of weeks. However, if the temperature and humidity fall below optimum levels, the development process halts and the eggs slip into dormancy. The newly hatched silverfish lack silver scales and are delicate and whitish. Once scales appear, the young larvae resemble the adults. The molting process continues to take place throughout the life of a silverfish. After almost 60 instars, it grows to .75 inches in length. The nymphs have similar eating habits to adults and can cause massive damage to paper products, foods, linen, wool and other items. The more they eat, the faster is their development. When the temperature and humidity are favorable and ample food is available to them, silverfish nymphs take a couple of months to mature into adults sexually. Sometimes, due to harsh conditions, such as a long winter, their development slows down due to which the maturation process extends to three years at times. One unique characteristic of silverfish is that they continue to molt even after sexually maturing. Adults gather in dark, humid, and moist places to mate. Female silverfish can reproduce several times during its entire life, producing offspring in the thousands. 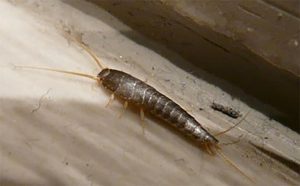 Unlike rodents, silverfish aren’t agile climbers and are often found trapped in sinks and drains, when they accidentally fall and are unable to carve their way out. 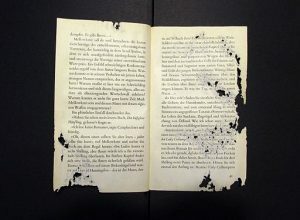 They can also create holes inside books, cotton, and other soft items. As we know that they continue to molt till the end of their lives, they are bound to leave their discarded exoskeleton on floors, crevices and other places around your home. Look out for this discarded husk. Nutritional traces of silverfish in a book. By Micha L. Rieser. Own work. Silverfish don’t spread any severe diseases and aren’t a major concern, but a growing silverfish population may indicate other severe problems. Silverfish stain floors, books, and any other surface that they walk on. Their stain has a characteristic yellowish-hue. 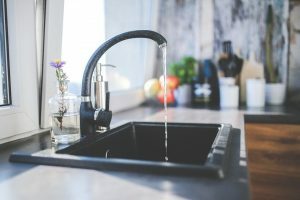 To prevent a silverfish infestation, repair areas inside your home that may be the cause of excessive moisture, such as leaky faucets. Silverfish thrive in humid environments. A dehumidifier can be used to reduce moisture in the air, and consequently lower the chances of silverfish survival. You can also ventilate attics, basements, and other close-off rooms to reduce humidity. Taking measures to remove standing water in your garden is another option. Place easily accessible food sources, such as cereal and pet food, in tightly sealed containers. Silverfish feed on a diverse list of foods, including paper, dead insects, cotton, glue, and even synthetic fibers. Declutter your rooms, bathrooms, and other parts of your homes, especially storerooms and attics. Books attract them because of the glue that binds the pages. Bookworms are advised to store their books in an inaccessible part of their home. Silverfish also inhabit outdoor environments like stones, leaf litters, bird nests and water puddles. Remove, or at the very least reduce harborage around your home.